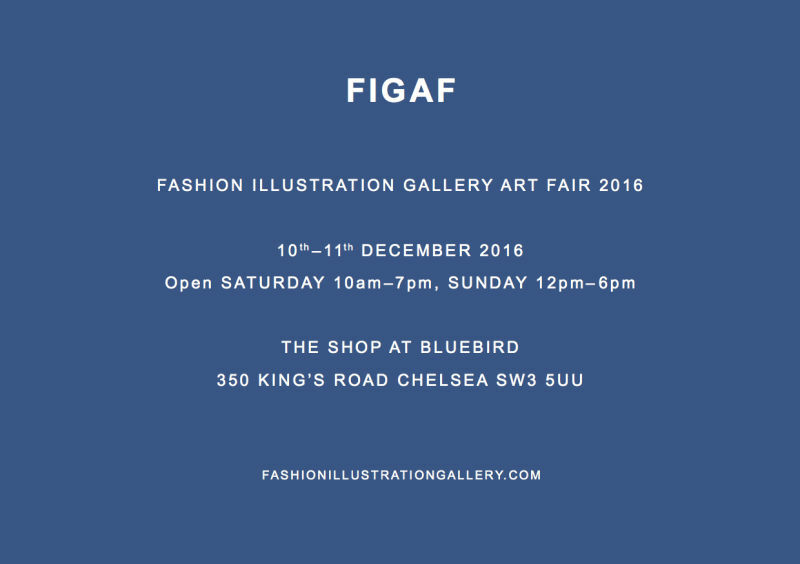 FIGAF, the Fashion Illustration Gallery Art Fair hosted at The Shop at The Bluebird, on Saturday December 10th and Sunday December 11th. The first edition of #FIGAF brings together some of the world's most brilliant artists who have created hand crafted fashion images. The line up includes, in no particular order: Gladys Perint Palmer, Richard Gray, Connie Lim, Frida Wannaberger, Poppy Waddilove, Cecilia Carlstedt, Amelie Hegardt, Rosie McGuinness, Richard Kilroy, Daisy de Villeneuve, Gill Button, Zoë Taylor, Luke Edward Hall, David Downton, Rob Phillips, Aurore de la Morinerie, Tanya Ling, Richard Haines, Gary Card, Tina Berning and Susannah Garrod. The interest in the genre continues to grow. Aided and abetted by the phenomenon of social media, the fair presents an exceptional opportunity to acquire, best in class, direct from the artists paintings, drawings, collages and prints at entry level prices.